James Ward established Jimbobart in 2009. 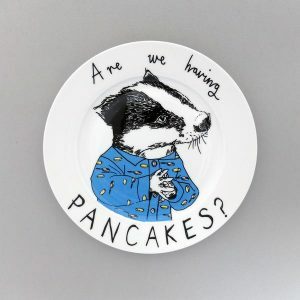 His illustrations, from his first ever plate design, the superhero ‘Sandwich Defender’, to a tennis-playing crocodile drawn in pen and ink for Lacosté – are a little eccentric and a lot of reflecting human traits. His products can also be found in lovely stockists round the world, including Liberty, London.